Just because you have bad knees doesn't mean you need to stop exercising. In fact, certain exercises, such as step exercises or exercises using a resistance tube, can be beneficial for people with bad knees, according to certified personal trainer Dan Falkenberg in an article for ColumbusSports.com. Low-impact exercises such as bicycling or even walking may help keep your knee ligaments flexible and supple. However, some types of exercise are off-limits because they can cause more harm than good and may exacerbate your condition. Any exercise involving squatting movements is contraindicated for knee pain. According to Lynn Millar, PhD, assistant director and associate professor of physical therapy at Andrews University in an interview with NBC New York, exercises, like squats, that involve excessive flexing are generally not recommended for people with bad knees. Deep squats involve an extreme bending motion and your knees end up supporting most of your weight, which could potentially exacerbate pain because of placing an inordinate amount of stress on your knee joint. Exercises involving high jumping are also contraindicated for knee pain. 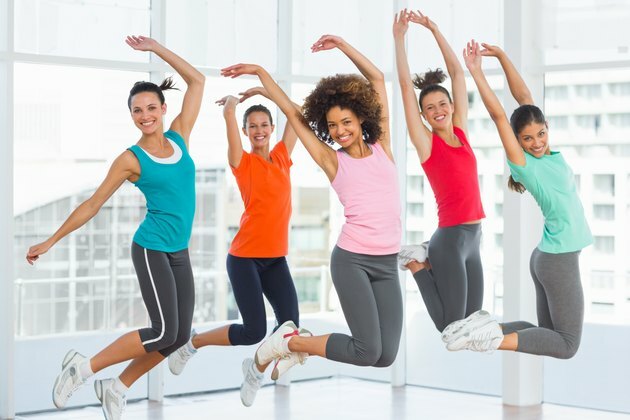 Jumping is a high-impact activity that shocks your knee joint and places stress on the knee when you land. Exercises involving jumping, known as plyometrics, include activities such as jumping up repeatedly to shoot a basket in basketball. According to Millar, these activities place a force of two to three times your body weight on your knees, potentially increasing your chances on injury and pain. Lower-impact activities, such as swimming and cycling, are more suitable for knee pain. Running is a high-impact activity that shocks and places a lot of stress on your joints. However, running is not a completely prohibited activity for bad knees. The surface you run on can make a big difference. Running on pavement or concrete is not advisable, because the hard impact can make your knee problems worse. According to Dr. Marc Darrow in his book, "The Knee Sourcebook," running on dirt tracks, running uphill or on a level surface as opposed to downhill and making sure you have properly fitting running shoes is advisable for runners with knee problems. Sports that require you to change directions suddenly often lead to knee injuries and should be avoided if you already have knee problems. These sports include soccer, volleyball, basketball and skiing. Kickboxing is another high-impact, high-intensity activity that can exacerbate knee pain, especially if certain movements are improperly performed. According to Diane Lofshult in an article for IDEA Health and Fitness Association, knee injuries are among the most common injuries caused by kickboxing. Actions performed in kickboxing, including front, back and side kicks, roundhouse kicks and knee lifts, can cause a jolt to your knee joint and exacerbate pain.